Good afternoon! I thought I'd take a break from my cleaning (not much fun there) to share this project with you (much more fun). This is one of the new stamps from The Greeting Farm, and I thought he was pretty cute and perfect for a guy project. I have a hard time with things for men, but I put this altered notebook together for my hubby and I'm pretty happy with it! I used the sketch from Card Patterns this week for the front of the notebook. 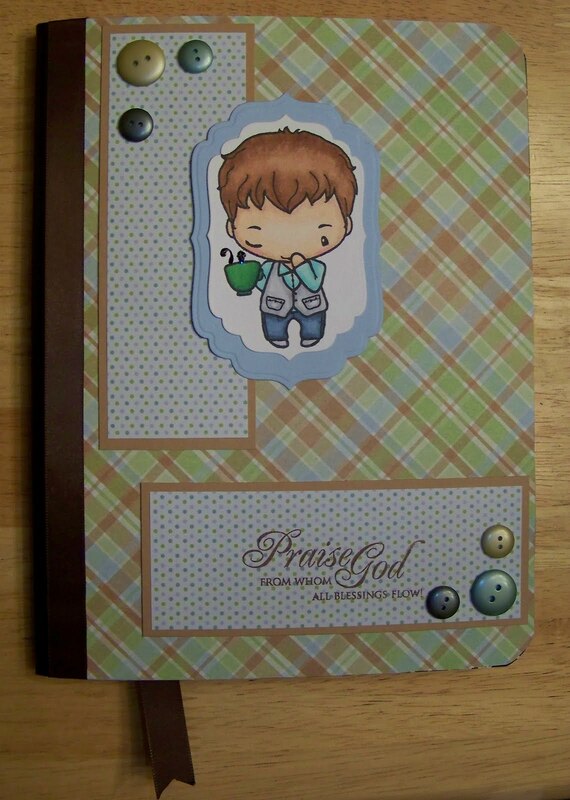 Supplies are composition notebook, image by Greeting Farm colored in with Copics. Paper is DCWV, cardstock is SU Bliss Blue and Creamy Caramel. Buttons are American Crafts, I think. Sentiment is from Clear Dollar Stamps with Memento Brown ink. Ribbon is from my stash. Very nice, what a great journal for your hubby. What a cute card. Thanks for playing with us at Card Patterns. Awww, isn't he adorable, great project! WOW girl I'm in love, in love with your color combo and this image. Great journal.. I bet your hubby loved it!! Critter Monday - It's a Sketch! In the Mood For Snow...men! Critter Monday - Texture it!